I should tell you that my idea of the most fun day ever begins with mimosas and moves into a squad of butlers meeting my every, self-indulgent need….OR wait, my kids painting my toenails and making me breakfast in bed and weird cards of adoration and cookies they saw on TASTY. Maybe it oughta be a well-planned hike through an unparalled, northern Californian nature adventure…? All of them, good options. But that’s not my most fun day ever. My fun day starts with NOT knowing what to do. And better, it starts with my daughters and my husband, and us as a group- NOT knowing what to do. I, of course, as the author of a book called THERE’S NOTHING TO DO!, have a bit of an interest in the notion of what to do on a given day. So the most fun day ever, for me and my brood of husband, daughters, dogs, cat, and- let’s not forget- BOOTS the Cornsnake is…to say the least…unstructured. I love it when I get to see my kids objectively, from a little bit afar. I realize, in those moments, that they’re people…whole and growing, changing and discovering. So my most fun day? When they connect- when a nine-year-old and a twelve-year-old find a place- where one is reaching higher and the other one is smart enough to enjoy being young. They create cardboard Barbie apartments. They play with Legos. They argue absurd points of fact! They bake things. And my husband and I are gifted, with that moment of seeing from afar, peering around doorways. When we’re smart, we leave them alone. But they’re super cute and engaging and sometimes we scoop them up and take them somewhere for undeserved sugar products. See, giving your kid a treat after a great meal- that’s nice. Giving them a SURPRISE treat…OH MY GOSH, they think you’re some sort of magician! They think anything awesome might happen at any moment. And since they routinely cite precedent, they’ll remind you of the unearned sugar for years! Indeed, giving your favorite people a surprise joy may be a fine way to conclude a fun day. The most fun day- listening to them growing and learning from afar. Seeing how they scratch the dog under the chin the same place that I do. Watching them steep tea and discovering they prefer honey to sugar. Listening to them begrudge some part of our parenting and smiling, knowing they will be friends long after we’re gone. What is it? God is in the details? Life is in the margins? I don’t know. But there are a hundred amazing trips and hikes I’ve long forgotten and many tiny moments I was lucky enough to pay attention to that I will always remember. I’m sure everyone has their own idea of the most fun day they’ve had with their family…what I remember of mine? Watching my girls fall asleep in inner tubes on the deck after a long day of silliness. Then pretending I wasn’t smiling as I watched them dream. 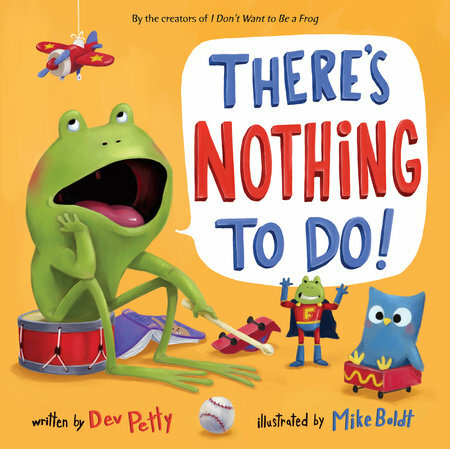 Dev Petty is a Berkeley native who writes picture books that, hopefully, make you laugh a little and think a little. She used to be in visual effects, working on The Matrix trilogy and many other film projects and loves making picture books because they’re sort of like little, paper movies. Her debut book, I DON’T WANT TO BE A FROG, has been published in eight languages and sparked two follow-ups including her latest, THERE’S NOTHING TO DO!. She is also the author of CLAYMATES and more stories to come.